“Steam Cleaning” is just a nickname for a method of carpet cleaning called “hot-water extraction.” The reason it’s called “steam” cleaning is because the water gets so hot that it “steams.” This method is the preferred method of cleaning by many major carpet manufacturers. In fact, some require you to use this service at least once every 12-18 to maintain a valid warranty. 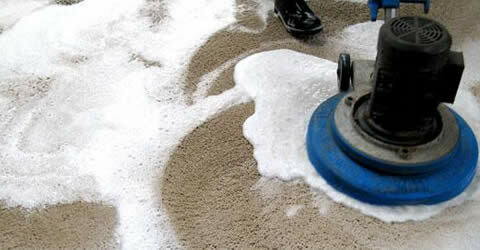 This type of cleaning is widely considered the best method of removing embedded soils and contaminants in your carpet. Steam cleaning works by injecting a pressurized solution into the carpet pile, then immediately extracting it with a powerful truck-mounted vacuum system. Most companies will apply a pre-treatment to break down soils, loosen oil deposits and remove spots. After the cleaning a protective coating can be applied to your carpet for an additional cost. This coating is commonly referred to as “scotchguarding.” Although it’s a trademarked brand name, this term is commonly used as a verb. This type of cleaning has been around for a while. Even though it’s lost its popularity, it’s still used as a first step in a 2 step process. In recent years there have been many advancements in synthetic detergents, preventing re soiling, a problem previously associated with this method. The rotary floor machine used with this process has a feed line that injects a chemical into the carpet. This chemical, combined with the agitation from the rotating brush, begins to foam, giving it proper lubrication. As the brush rotates, it agitates the soils and suspends them. Some floor machines have a vacuum system attached, enabling it to extract some of the loose contaminants and soils. Other machines simply rely on the agitation. The rotary brush has recently been demoted cleaning world. What has replaced it is a much safer and effective CRB (cylindrical rotating brush) machine. The CRB spins vertically, lifting the piles instead of horizontally like a rotary machine. The process does not take long and extensive training is not needed. The agitation is a great way to suspend soils. Even with a vacuum system, thorough removal of soils is hard to achieve. No hot water, which is a key component in cleaning anything and killing germs. Potentially damaging to carpets from too much agitation or stiff brushes. Also referred to as absorbent pad cleaning, this system is primarily used for maintenance cleaning, although some companies use it as a primary cleaning. 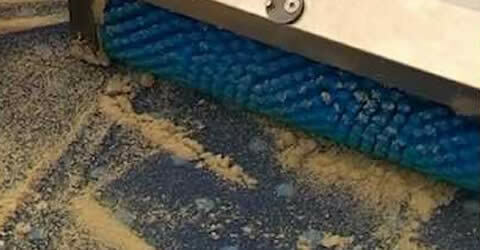 This method consists of using a rotary floor machine with an absorbent pad or towel, called a bonnet, placed underneath the spinning drive block of the machine. Most bonnets are made of microfiber. A special treatment is applied to the carpet before the bonnet is used. The cleaning agent is usually a water-based formula with solvents added to aid in the cleaning and drying process. After the pre-treatment is applied the bonnet, slightly damp, is used to buff over the carpet using overlapping strokes. The absorbent pad will pick up suspended soil and excess cleaning solution. The pad must be replaced before it becomes too saturate and no longer picks up soil. There are a variety of chemicals used with bonnet cleaning, but most will use an encapsulate. This method is growing in popularity in commercial office buildings such as high-rise buildings. It's easy to operate and requires very little in chemicals and equipment. The treatment used in this method is very unique and scientifically advanced. It is a powder that is impregnated with cleaning agents and solvents. This power is spread over the carpet either by hand or spreading machines, then agitated into the carpet with a counter rotating cylinder brush machine. The powder is designed to release and suspend the soil and absorb into the powder product. After 15-30 minutes of dwell time the powder is then vacuumed up. You can use a variety of inexpensive cleaning equipment like a rotary machine or CRB machine when using absorbent compound cleaning. The newest cleaning method, encapsulation cleaning, is not really a “method,” it’s more of a system that can be used with several different cleaning methods. Encapsulation chemicals use emulsifiers to dissolve oils and grease. The encapsulation chemistry, combined with strong agitation can loosen and suspend particle soil. During the cleaning process, covalent chemical bonds, called polymers, coat the carpet fibers and soiling. Over time the polymers will crystallize with the suspended soil. 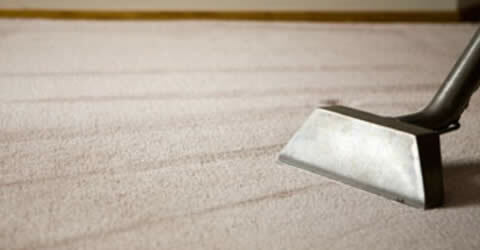 After the carpet is dry, the crystallized soil can easily be removed by simply vacuuming. Encapsulation provides a good appearance, fast production rates and high resistance to wicking. 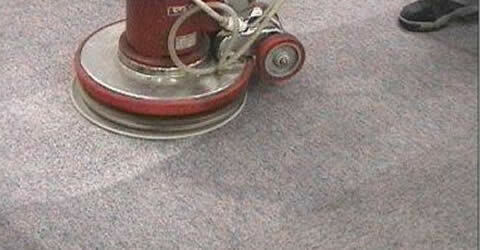 This is a great option for general maintenance cleaning in commercial carpet cleaning. However, for deep cleaning, hot-water extraction is still the preferred method.